Michael Keating (second from right), the Special Representative of the UN Secretary-General (SRSG) for Somalia, addresses journalists during a press conference on the release of a UN Report on the Protection of Civilians in Somalia. The report was released in Mogadishu on 10 December, 2017. 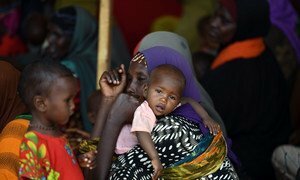 The armed conflict in Somalia continues to exact a heavy toll on civilians, damaging infrastructure and livelihoods, displacing millions of people, and impeding access to humanitarian relief for communities in need, according to a United Nations report launched today in the country's capital, Mogadishu. The report – “Protection of Civilians: Building the Foundation for Peace, Security and Human Rights in Somalia” – covers the period from 1 January 2016 to 14 October 2017, and was produced by the Office of the UN High Commissioner for Human Rights (OHCHR) and the UN Assistance Mission in Somalia (UNSOM), which Mr. Keating also heads. During this reporting period, UNSOM documented a total of 2,078 civilian deaths and 2,507 injuries, with 60 per cent of the casualties attributed to Al Shabaab militants, 13 per cent to clan militias, 11 per cent to State actors, including the army and the police, four per cent to the African Union Mission to Somalia (AMISOM), and 12 per cent to unidentified or undetermined attackers. Civilians were the victims of unlawful attacks – by being directly targeted and through the use of indiscriminate bomb and suicide attacks – by non-State groups. Such attacks, which are prohibited under international human rights and humanitarian laws, are, in most cases, likely to constitute war crimes, and it is imperative that perpetrators are identified and held accountable, the report notes. The worst incident on a single day was the twin bomb blasts in Mogadishu on 14 October, attributed to Al-Shabaab by Somali government officials and in which at least 512 people are officially recorded to have died as of 1 December, along with 316 injured. The attack received widespread condemnation, including from UNSOM and Secretary-General Antonio Guterres. A significant number of recorded civilian casualties – 251 killed and 343 injured – was attributed to clan militias, in areas where federal or state security forces are largely absent. “The drought has intensified clan conflict due to competition over resources. These conflicts are exploited by anti-government elements to further destabilize areas, diminish prospects for lasting peace and weaken civilian protection,” the report states. It goes on to note that the number of casualties attributed to the Somali National Army and Police, as well as to AMISOM, was significantly smaller than those attributed to Al Shabaab militants. “Nevertheless, such casualties are of utmost concern as they undermine the Somali population's trust in the Government and the international community, which in turn expands the space in which anti-government elements continue to operate,” said the UN High Commissioner for Human Rights, Zeid Ra'ad Al Hussein. Somalia's National Intelligence and Security Agency routinely disregards international human rights law when carrying out arrests and detentions, according to the report, which adds that journalists and people suspected of belonging to Al Shabaab are often detained without charge. The report also flags that information on the conditions of people living under Al Shabaab control is scant. Verifying human rights violations and abuses in those areas remains problematic due to the lack of access and fear of reprisals. Somalia has been plagued by armed violence for decades, as well as poverty, marginalization, natural hazards, insecurity and political instability. UNSOM is working with the East African country's authorities to support national reconciliation, provide strategic and policy advice on various aspects of peacebuilding and state-building, monitor and report on the human rights situation, and help coordinate the efforts of the international community.